Voltage clamp step onset behavior for continuous and stochastic channels. 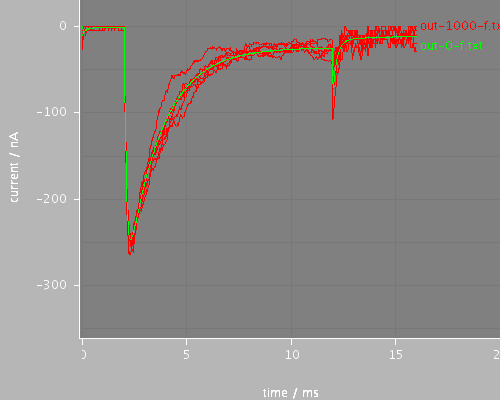 The step begins at 1.985ms and the timestep is 0.02ms. This uses the average evaluation method for the step, (stepStyle = average in the voltage clamp) so the effect is as if the onset occurred in two steps: one step beginning at 1.98 to the average of the hold and step values over the step (about 0mv in this case - three quarters of the way from -80mV to 30mV) and the next step beginning at 2.0ms with potential fixed at the step value (30mV). In this case, the use of the average produces an artifact in the results: the step to 0mV opens fewer channels but gives a larger current (larger driving force at 0mV than at 30mV) than a step to 30mV would. The following step takes it to the normal current at that stage of the step, but because the previous current was so big, the transition between steps appears flatter, giving the appearance of a kink in the current. 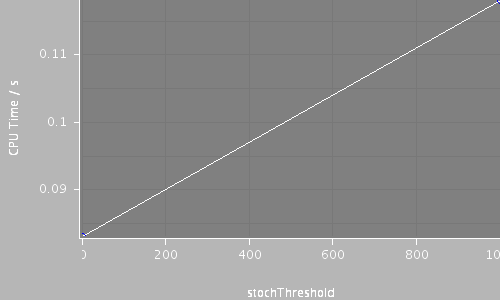 This fugure should be compared with the file run-onset, which does the same calculation but with stepStyle = midpoint for the clamp. 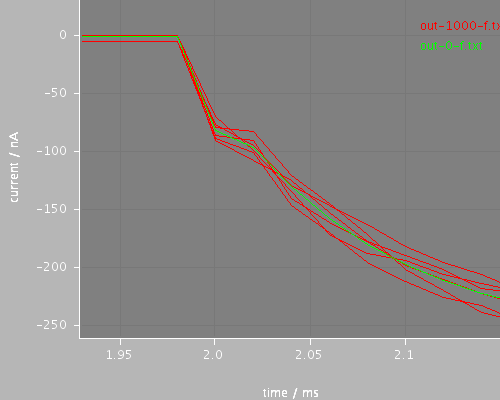 and the next step beginning at 2.0ms with potential fixed at the step value (30mV). appearance of a kink in the current. the file run-onset, which does the same calculation but with stepStyle="midpoint" for the clamp.